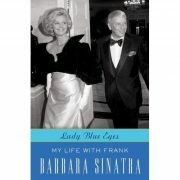 Eight years ago, George Jacobs, Frank Sinatra’s longtime valet, published Mr. S: My Life with Frank Sinatra, a fascinating look at the man behind the voice, told from the vantage point of someone with near-total access to the über-private superstar’s most private moments. Jacobs’ association with Sinatra ended abruptly (as so many of Ol’ Blues Eyes personal and professional relationships tended to do) in 1968. Now, along comes what should, and could, have been the rest of the behind-the-scenes story, as told by Sinatra’s fourth wife, Barbara. Trouble is, the author of Lady Blue Eyes seems more interested in trying to make herself interesting than in providing fresh perspective on her immensely interesting third husband. The book starts well, with the estimably plucky efforts of Barbara Ann Blakely to escape, at the urging of her equally socially ambitious mother, the confines of small town Missouri, build a semi-successful career as a model and a Vegas showgirl, survive a bad marriage (from which came her only child, Bobby) and prove an astute businesswoman through various ventures including a lucrative charm and modeling school. Ah, but Barbara’s reach always equaled her grasp. She went after what she desired, and invariably got it. What begins as a clandestine affair with Sinatra quickly escalates to a fulltime romance, though Barbara remains in an agitated state of limbo, never knowing when the merry-go-round may stop (a rather justifiable fear, given Sinatra’s love-’em-and-leave-’em proclivity). He showers her with expensive gifts – gemstones, Jaguars, a Palm Springs house (since, after the Zeppo breakup, she has no home of her own). Still, no proposal. That she tricked him into asking for her hand is debatable. But, as she tells the story, after Sinatra proffered a massive diamond and told her to have it set however she pleased, she had it made into a ring, then arranged for it to be shipped back to Frank. When he re-presented it to her, she coyly told him to choose which finger it should go on. He picked the left-hand digit Barbara was hoping for, and she sighed a huge sigh of relief. Once the wedding (or weddings, since there was two) takes place, Lady Blues Eyes becomes little more than a jetsetter’s travelogue. As name-droppers go, Barbara is world-class: skiing in Switzerland with the Pecks (Gregory and Veronique, that is, or as Madam Sinatra chummily calls her, “Vero”), poolside cocktails with the Douglases (Kirk and Anne), country club evenings with the Annenbergs (magnate Walter and wife Lee), all amid a whirlwind schedule of fetes and fundraisers alongside leaders of countries, commerce and entertainment. There’s an equally heady parade of priceless baubles, bangles and beads to behold, plus the opulent hotels suites, restaurants and shops that are all part and parcel of trailing the world’s most beloved singer on endless world tours. Yes, lots and lots of names, but very little insight. Dean Martin, Sammy Davis Jr., various Kennedys, several presidents and assorted other fascinating characters pass by, yet we learn nothing that hasn’t already been detailed far better in other books. Admittedly, there is one chapter toward the book’s end that adds genuine warmth. It starts out rather awkwardly when, asked by a Palm Springs pal to help with a fundraiser for abused children, Barbara says, ‘I’m really busy with my other charities, and anyway child abuse doesn’t happen to anyone I know. I don’t have a connection with this at all.’ Not long after that statement, she does, however, agree to assist and ends up becoming a valiant champion for the cause. Indeed, the tale of her commitment (which continues to this day) to build and maintain what would become the Barbara Sinatra Children’s Center, globally recognized as one of the finest and most innovative facilities of its kind, is so hugely commendable that it nearly makes up for all the puffery that surrounds it. She does, of course, also speak occasionally of Sinatra’s music, understandably focusing on the latter (and least interesting) portion of his career; but fans expecting musical revelations will be sorely disappointed. Ultimately, apart from its mawkish vacuity, what really sinks Lady Blues Eyes is what has been left out. She daintily sidesteps the question of her husband’s alleged mob connections, echoing the tired rationale that anyone who works in nightclubs and Vegas will inevitably run up against shady characters. Sinatra’s notorious temper is mentioned, quite often in fact, but is usually shrugged off with a laugh and a kittenish allusion to kissing and making up. The most appalling omission has to do with Frank’s three children. Frankie Jr. is mentioned a total of three times, always in passing. Nancy Jr. and Tina are never included by name and, in fact, never discussed at all (apart from one fleeting reference to “Frank’s children.”) Surely, the calculated exclusion has to do with the well-publicized animosity that exists between the kids and wife number four. Still, in remains an enormous elephant in Barbara’s lavishly appointed rooms. Mr. Jacobs understood his sideline role as an observer offered privileged access, and used it to excellent advantage. His book was rarely about himself. While Mrs. Sinatra IV was, of course, fully her husband’s partner, she makes the mistake of assuming that such a position makes her life as enthralling as his.